But designers agree a little can go a long way when it comes to bringing in bright blooms and bold floral prints. In the traditional sense, chintz typically refers to a type of shiny, cotton floral fabric used in upholstery, drapery and even applied on walls. The term originated from glazed calico fabrics specifically imported from India, featuring flowers and other patterns typically on a light, plain background. As a design style, chintz typically refers to the layering upon layering of floral patterns, says Arianne Bellizaire, an interior designer and blogger from Baton Rouge, Louisiana. Envision your grandma’s living room, a Victorian bed-and-breakfast or French country style, overdone with floral patterns on furniture, curtains, canopies, bed linens and walls. “Chintz can come off as tacky to some, but for those who do it really well, their clients love that look. They appreciate the boldness of it,” she says. Modern chintz is more tactful, sophisticated and carefully placed to blend with a room’s overall décor. Done right, chintz is a way to have some fun and create a feeling of airy lightness, adding color, texture and classic comfort to a room. 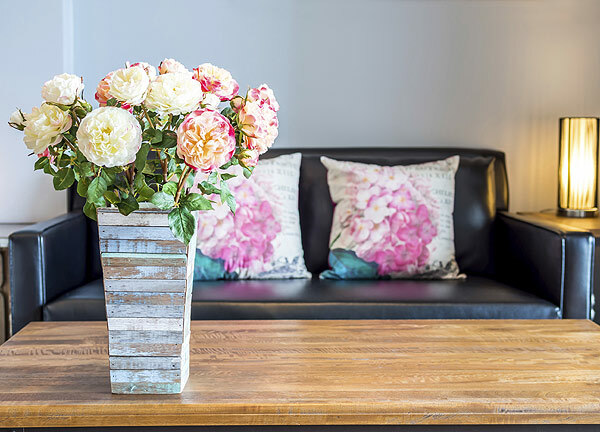 Trends in interior design follow fashion, and florals started creeping into home décor after showing up on runways the last few years, says Faith Phillips, design and trends expert for La-Z-Boy. Chintz pops up most often in Shabby Chic-inspired designs, but a touch of floral in a kitchen, bedroom or bath can be done in a refreshingly updated way. Chintz can be feminine and flirty, contemporary or country. It’s quite versatile and even works with stripes, Oriental, antique and eclectic boho styles. Maybe it’s dainty, pastel flowers on a sofa cushion or accent chairs, a bold flower on a rug, or bright floral artwork, throw pillows or a floral pattern on one wall. Wallpaper, as opposed to fabrics, with large-scale floral print looks more modern. Unless you really love the floral look, rather than investing in a sofa with a floral print, Phillips recommends buying furniture in a neutral color and style. Go with something that’s timeless, comfortable and functional.